Gotta fly with the best of them, but don’t die like the rest of them. Unless you’re a giant death bird, in which case it’s okay, you control the dead. You’re like a zombie bird of resurrection! Yveltal-GX is a Basic Darkness Pokemon, 180 HP, with a Lightning Weakness, a Fighting Resistance, and a Retreat Cost of 2. Absorb Vitality is a 1-for-20 that heals back the same amount as the damage dealt, while Sonic Evil is a 3-for-100 move reminiscent of Shred, except that it’s mainly focused on not dealing damage based on either Weakness or Resistance, and it’ll still get stopped by Abilities and effects that prevent moves from GX from working. Speaking of moves from GX, Doom Count GX costs only 1 Energy, but it automatically KOs the other Pokemon, provided they have exactly 4 damage counters on them. Overall, this is the least powerful Yveltal has been – EX, GX, or otherwise. Absorb Vitality hardly does any damage, meaning you’d have to power him up much more to make it worthwhile. Sonic Evil would’ve been better without the Weakness clause stuck in there, but then there’s Doom Count. It would take 2 turns of Absorb Vitality to bring about the exact amount of damage Yveltal-GX needs – and that’s the problem with the entire plan. Outside help not withstanding, Yveltal-GX is way too slow to utilize Doom Count GX on its own, and its only other move does too much damage. It’s okay to be able to KO something for free, guys – I know you’re sketchy about it, but this is still once per game. Just don’t pull a Bonnie out for Yveltal-GX, and you’re golden. Which Yveltal-GX itself is not. It’s not golden. Don’t let the rarity fool you. Arora Notealus: Yveltal-GX tries to do a lot with a little, but he ends up with too little to do a lot with. I’m guessing they don’t want a Yveltal-EX in the modern game? But maybe this is a step too far in the wrong direction. Side Review: Sylveon – I’d imagine the big deck Sylveon could go into is the Gardevoir-GX build, but they’ve already got a Sylveon in the line-up. I’d say that Wink Wink was a good enough move that Sylveon didn’t have to worry about anything going on elsewhere, but I would say it’s been underwhelming in a sense. Not many decks can make good use of a sneaky card like that, which works better in the early game and usually on the first available turn to attack – going second. Next Time: Flying through the sky one hoop-de-loop at a time! Ah yes, we can’t forget the other two legendary Pokémon of Kalos after we covered Zygarde-GX. Yveltal-GX is a Basic Dark type with 180 HP, weak to Lightning, resists Fighting, and a retreat cost of two. Absorb Vitality costs D for 20 damage and heals the same amount of damage that you did to the Defending Pokemon. If there’s any form of damage boosting items then it might be worth using. Devoured Field and Choice Band comes to mind; you can do 60 damage against EX/GX and heal 60, or if they’re weak to Dark, 120 damage and heal 120! Sonic Evil does 100 for CCC without factoring weakness and resistance. And Doom Count GX works only if the Defending Pokemon has exactly 4 damage counters on it, and when it does, it insta-KOs it. I can’t think of any reason to use this card. Seems like Doom Count GX has some appeal, but you still need good timing. Like putting four damage counters and using that GX attack in one turn, instead of the two turn strategy. 2 Frogadiers might work, as with 2 uses of Feather Arrow from Decidueye-GX. But then Yveltal-GX is left with two mediocre attacks that won’t provide serious pressure against some of the popular decks that we’re still facing against. Yveltal GX (FLI 79) swoops into the meta out of the Forbidden Light expansion set. This 180 HP Dark type Basic Pokemon has three really disappointing attacks. 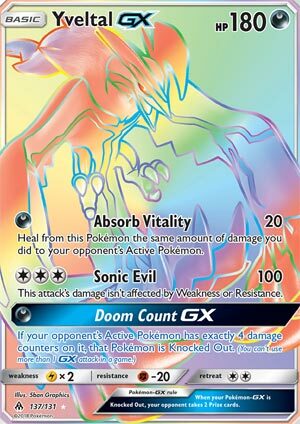 Absorb Vitality, for a single Dark energy, does twenty base damage and then heals the amount of damage done to the opponent’s active Pokemon. Meaning, if you have Choice Band and Devoured Field out, you do sixty damage and then heal sixty to yourself. It’s almost as if you could imagine this card as being a Stage 2, single prize Pokemon. Look at the card and cover up the header. Weak or conditional attacks. This looks like your typical Stage 2 single prize non GX Pokemon. These attacks are just awful. Maybe this could be a one of tech in Pokemon, but you couldn’t make this your feature attacker and expect to win many games on the ladder. I figured I’d do better with Yveltal EX than with Yveltal GX… and that’s what I set out to try to find out. I put Yveltal EX and Yveltal GX in almost identical 60 card lists (had to swap out Brigette for Nest Balls in the EX list) and decided to play ten matches with each version to see which was the better deck. I paired them with Garbotoxin Garbodor to relive Yveltal’s glory days about a year and a half ago when Yveltal Garb dominated the format. In case you don’t remember, around December 2016 – right before the first GX cards were released – this was the dominant deck in the meta. It reached its height at the London Internats on December 9, 2016 when each of the top five finishers were Yveltal Garb. It was 1st and 2nd at the Fort Wayne regionals two weeks before that and 2nd and 3rd at Dortmund a week before Fort Wayne. Maybe you’ll be surprised at what I found out from this deck by deck comparison, maybe you won’t. Where you won’t be surprised with is how bad Yveltal GX was. It took only five matches for me to confirm that it’s just an awful card. I went 2 W 3 L with Yveltal GX. I won a match where my opponent was playing a Fire deck but conceded early on when I got Garb online. I also beat a Metal Toolbox deck as well. But the other three losses were just bad – one against a Greninja Break deck that took six prizes without ever dropping a single Shuriken. What will probably shock you: how good Yveltal EX still is. I won seven of the ten games I played. Two of the three losses were razor thin defeats – one in which I was twenty short of OHKO’ing a Greninja GX, another where Espeon GX had exactly enough damage to OHKO my Yveltal EX. The only meta decks I faced were two games against Necrozma GX, but I easily won both of those matches. And maybe it was more of Garbotoxin Garbodor that contributed to the victories than either Yveltal, but I was honestly really very surprised at how competitive Yveltal EX still is. Certainly much more so than its GX cousin. I don’t think Yveltal EX is the BDIF by any means, but I’d bet you’d win a fair number of matches in Columbus with it. Yveltal GX is just another disappointing GX Pokemon. It’s not much better than Kommo-No GX. The designers really disappointed me on this one, I really hoped that Yveltal GX would have similar attacks to the previous version, maybe better. Maybe something really crazy like fifty damage times the number of Dark energy attached to it or something like that. This card has little redeeming quality, maybe its GX move at best, and is at most a single tech in to Dark decks. But even in my Zoroark Weavile deck, I’m not rushing out there to try to squeeze this in.